In summer 2019, professors Sarah Hogan and Joanna Ruocco will co-lead a study abroad course called Literature of the Witch in London. Students will examine wide-ranging works of English literature—mostly by women writers—that portray the lives of rebellious women, particularly those who seek uncommon or magical means for personal empowerment, and in so doing, confront cultures that persecute or alienate those who defy patriarchal ideals of passive femininity. They will attend theatrical productions and see the sites in London, Cornwall, and Essex, and observe how these places narrate and memorialize the history of witch trials and executions. Moreover, they will write fiction in response to their experiences, participating in the tradition of writers who walk to write (e.g., Charles Lamb, Charles Dickens, Virginia Woolf), while developing their skills as creative observers. Students can learn more and apply at studyabroad.wfu.edu or email Dr. Hogan at hogansa @ wfu.edu. In early modern Europe, it is estimated that more than 110,000 women were tried as witches, with 48% of these trials ending in execution (Levack). Often, the accused were spinsters, healers, midwives, heretics, poor peasant women, or those whose knowledge, or very being, challenged Renaissance ideals of a chaste, silent, and obedient femininity and brought them into conflict with church or state power. Witch hunts, and more spectacularly, witch burnings, played a critical role in disciplining and controlling female bodies at the moment when new class structures, gender roles, and imperial relationships were coming into being. The fear and violence generated by the 15th, 16th, and 17th century campaigns against witches form part of the history of economics as well as the history of sexuality. Today, the witch remains a dangerous, double-edged figure that represents both female persecution and female empowerment and gives us a template for thinking about the intersections of various forms of oppression and resistance. 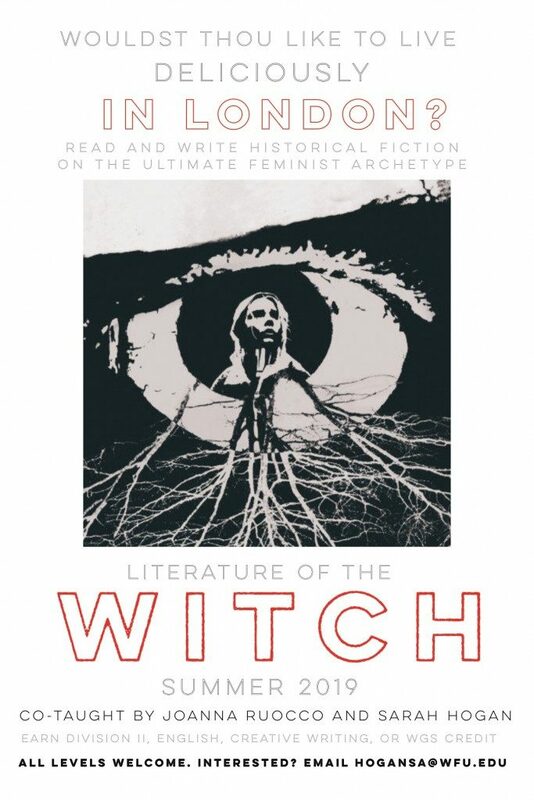 As we read works that span the centuries between the medieval and the contemporary, we’ll discuss how and why the witch came to be a central feminist archetype. Along the way, we will discuss what “witch”—as symbol, as slander, as self-description—means in the present day. The course aims to bridge critical-creative divides, drawing upon Dr. Ruocco’s training in fiction and her accomplishments as a novelist and experimental writer, and Dr. Hogan’s expertise as a scholar of British Renaissance literature. Because the course is based in London, we will tour many of the historic sites (counties, castles, dungeons, libraries, museums, theatres, woodlands and seascapes) that set the scene of our literary readings. Just as importantly, then, this study abroad course integrates content and place, adopting an experiential, immersive, and interdisciplinary model of learning.